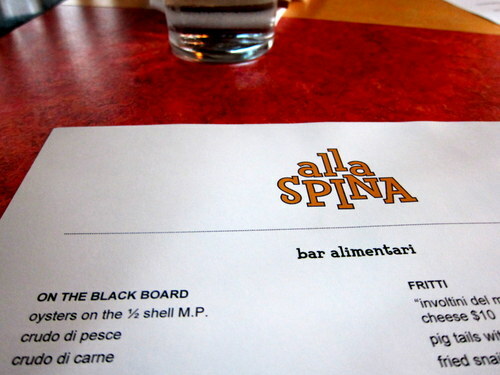 Alla Spina is a casual beer and food spot brought to you by Mark Vetri on N. Broad st. They really like their pigs here, judging by all the pig art in the place! Oh, and there’s also lots of pig parts on the menu. It’s also right around the corner from Route 6, Stephen Starr’s seafood joint. They’re trying to create a bit of a restaurant scene up on that section of Broad, so here’s wishing them some luck. There’s outdoor dining, weather permitting, and it’s nice and open and not at all stuffy. It really is a nice and casual place. 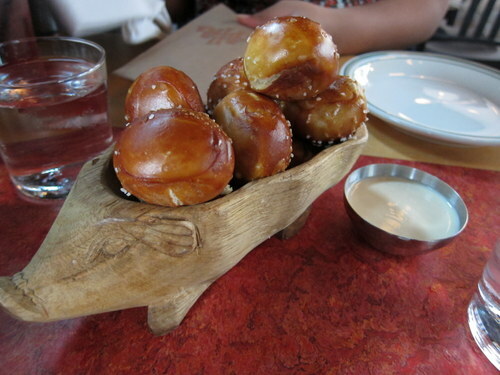 Can you get more casual than pretzels? These are housemade pretzel bites with spicy beer cheese. See the cute little pig they get served in? I liked these quite a bit… warm and doughy! 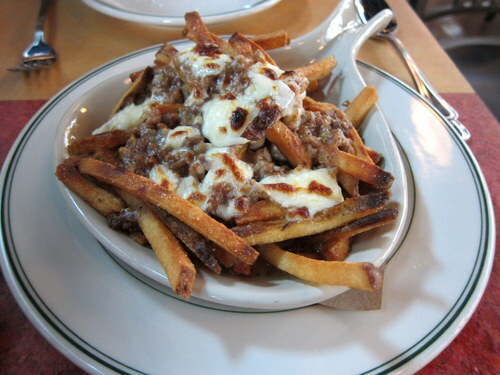 You’re not in canada, but they serve their own version of poutine here. It’s served with a guinea hen leg bolognese and mozzarella curd. I wasn’t too crazy about the bolognese part. But the fries were good. 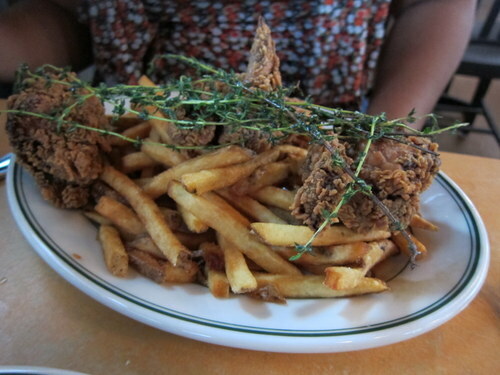 Maple glazed fried chicken and fries! There was so much, E took plenty of it home as leftovers. There are those tasty fries again. I had the fancy grilled cheese, with taleggio and roasted red peppers, served with green tomato conserva and homemade potato chips. Yum! That green tomato conserva stuff is amazing! I want to put it on everything now. 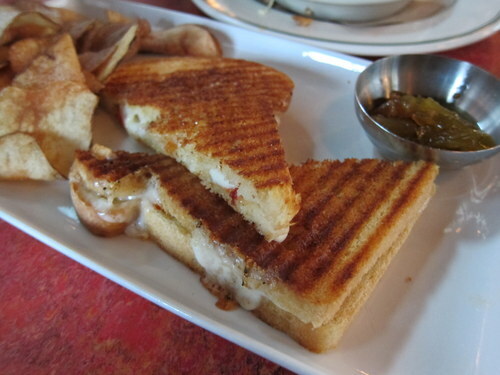 And the roasted red peppers inside the grilled cheese was a nice touch. While we were eating, we saw all the tables getting soft serve vanilla ice cream. It confused us a little bit. Then we found out that it was actually fiordelatte soft serve, not just plain vanilla ice cream, not like the thing you would get at McDonald’s. The flavor itself is more of a sweet cream. We got a bowl of it along with the famed donut bread pudding. 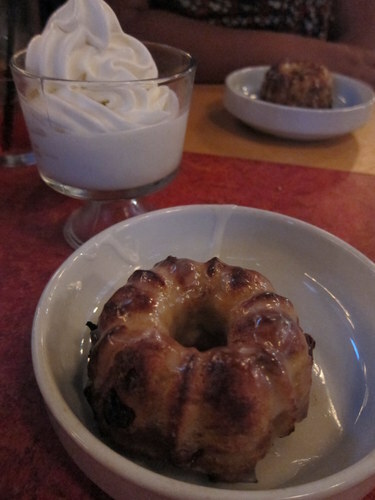 The bread pudding was delicious, but I could have certainly gone without the raisins in it. The fiordelatte was also creamy and dreamy. This was a fun spot. Service was good and the food came out quickly. Although it’s a bit further away from the action of the city, but it’s kind of like a retreat from all the hustle and bustle.